Improving sustainability practices at Caltrans. Improving system-wide transportation, sustainability, and multi-modal integration across California. Improving transparency, accountability, and communication for sustainability performance measurement. In total, Caltrans conducted four evaluations of different statewide plans using the SP module, four evaluations of specific projects using the PD module, and one INVEST evaluation of their Operations & Maintenance Programs using the OM module. This case study represents an unusual example in which an agency used all three evaluation modules on a variety of projects and programs. 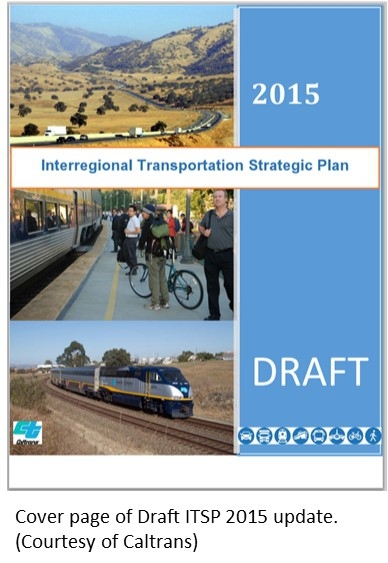 Caltrans used INVEST to evaluate four separate statewide plans including the 1998 Interregional Transportation Strategic Plan (ITSP), the Project Initiation Document (PID), the Transportation Concept Report (TCR) for corridor plans, and the California Transportation Plan (CTP). The ITSP identified interregional highway and passenger rail corridors for upgrading to a higher design concept or capacity expansion. Given that Caltrans developed the ITSP in 1998, many of sustainability best practices identified in INVEST, like Linking Planning and NEPA (SP-17), were still emerging and evolving. As such, the ITSP did not receive any points for numerous criteria and ended up only receiving a total score of 49 points. However, the ITSP did go above and beyond when it came to Access and Affordability (SP-05), Safety Planning (SP-06), and Freight and Goods Movement (SP-08). Caltrans recently updated this document to better evaluate sustainability, economic viability, and resiliency of the interregional transportation system. A PID is an engineering or technical report that documents scope, cost, and schedule for transportation projects. Caltrans’ PID program received a total score of 60 points. It was most successful in Financial Sustainability (SP-12), Analysis Methods (SP-13), Transportation Systems Management and Operations (SP-14), and Linking Planning and NEPA (SP-17). For each state highway, a TCR identifies current and projected operating conditions on the facility, establishes a 20-year planning concept, identifies facility deficiencies in relation to the concept, and identifies broad and flexible options to achieve the 20-year concept. Caltrans’ TCR received a total score of 52 points. Its most successful criteria were Analysis Methods and Linking Planning and NEPA (SP-17), followed by Integrated Planning: Social (SP-03) and Freight and Goods Movement (SP-09). The CTP is a statewide, long-range transportation plan that provides a policy framework for meeting statewide transportation needs; defines goals, policies, and strategies; and envisions a sustainable system that improves mobility and enhances quality of life. The CTP received a total score of 98 points, making it the most successful individual statewide plan evaluated by Caltrans using the SP module and achieving INVEST’s Silver achievement level. This plan was particularly successful in Freight and Goods Movement (SP-08), Travel Demand Management (SP-09), Air Quality (SP-10), and Energy and Fuels (SP-11). Across the four plans it evaluated, Caltrans noted that there was room for improvement when it came to Linking Asset Management and Planning (SP-15) and Infrastructure Resiliency (SP-16). The team used the Project Development module for four projects. The first project was the Hanford Expressway Project on Route 198 in Kings and Tulare Counties, a recently completed highway. The project converted 10.1 miles of a rural 2-lane conventional highway to a 4-lane expressway using the existing alignment. The team gave the project a final score of 38 points, which achieved INVEST Bronze level. The Caltrans team emphasized that the effort required to do this analysis was relatively low, and that the discussions that emerged from differences in scoring were invaluable. The second project was the Wye Highway widening project on Route 46 in San Luis Obispo County. The project scored 66 total points (INVEST Gold level). Caltrans noted that some of the questions in the evaluation could only be answered for the entire corridor rather than this one project specifically, since there was only a corridor-wide environmental document. Additionally, some questions in the evaluation were not appropriate for the early phase in which the project was evaluated. The third project was the Fresno Panoche Overlay-Resurfacing and Restoration, a recently designed but not yet completed highway project. The project is located in a highly rural area on an interstate freeway with large traffic volumes. Using the set of questions specific to the INVEST Pavements scorecard, the team gave the project a final score of 18, which equates to INVEST Bronze level. However, when answering all questions included in the PD module (not just those included in the Pavements Scorecard), the project earned 36 points, achieving INVEST Platinum level. The fourth and final project was a Preventive Maintenance Grind and Overlay in San Joaquin County, a recently completed highway project. The team gave the project a final score of 16, which is one point below the Bronze level. However, there were several questions where the agency could have awarded up to 7 more points if it had considered Caltrans’ methods and processes more broadly or made some conservative assumptions. Ultimately, Caltrans chose to use a very literal interpretation of the INVEST requirements to arrive at their final score. Caltrans also used INVEST’s OM Module to evaluate its Operations & Maintenance Programs. 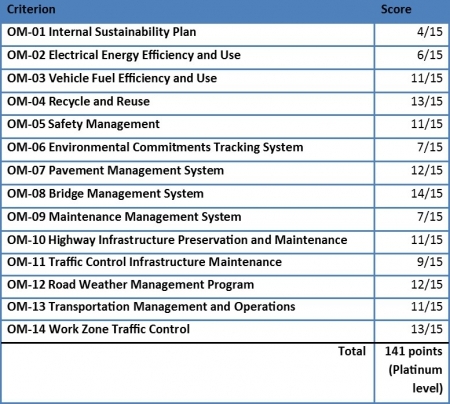 Caltrans earned a total score of 141 points, achieving a Platinum rating (see the table to the right for scoring details). Caltrans was most successful in addressing the following criteria: Bridge Management System (OM-08), Recycle and Reuse (OM-04), Road Weather Management Program (OM-12), and Work Zone Traffic Control (OM-14). Though it achieved a high score in the aforementioned criteria, Caltrans found it had room for improvement in its Sustainability Plan (OM-01), Electrical Energy Efficiency and Use (OM-02), Environmental Commitments Tracking System (OM-06), and Maintenance and Management System (OM-09). Caltrans found INVEST to be a useful tool for initially incorporating sustainability into their organization. 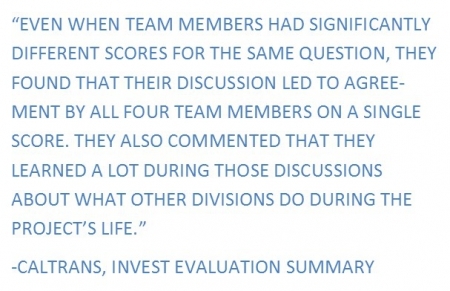 The collaborative discussions spurred by the INVEST evaluations were invaluable. Caltrans found the applications most useful at the program level in all three modules. Caltrans continues to explore ways to identify sustainability measuring tools for prioritizing projects.